I made these stenciled coasters for our apartment in India. It’s hot and humid in South India. Drinks sweat. Drinks sweat A LOT. Humans sweat too. Which means we have to drink. And the drinks sweat. It’s a never-ending cycle of sweat. I found these wood squares in the art section of Michael’s. There are also wood coasters in the woodcraft aisles. But they were thicker, and I liked the slim shape of these wood squares. 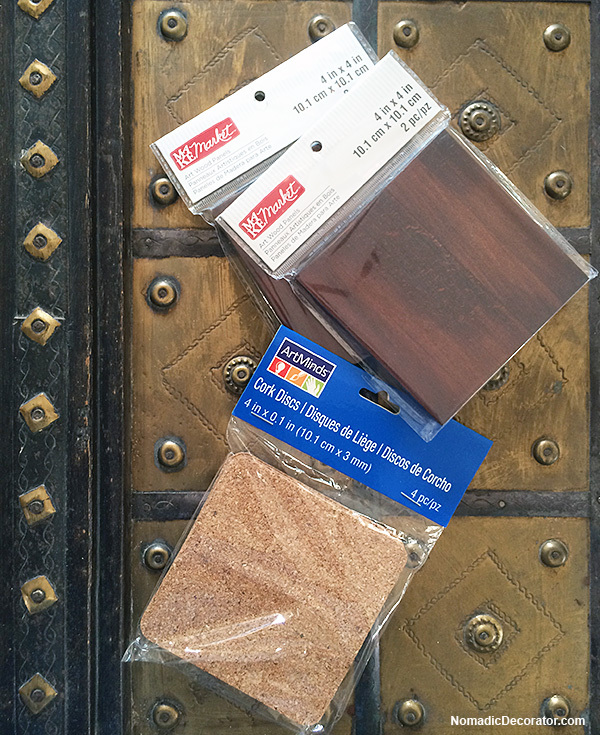 I also found 4″ x 4″ cork at Michael’s. 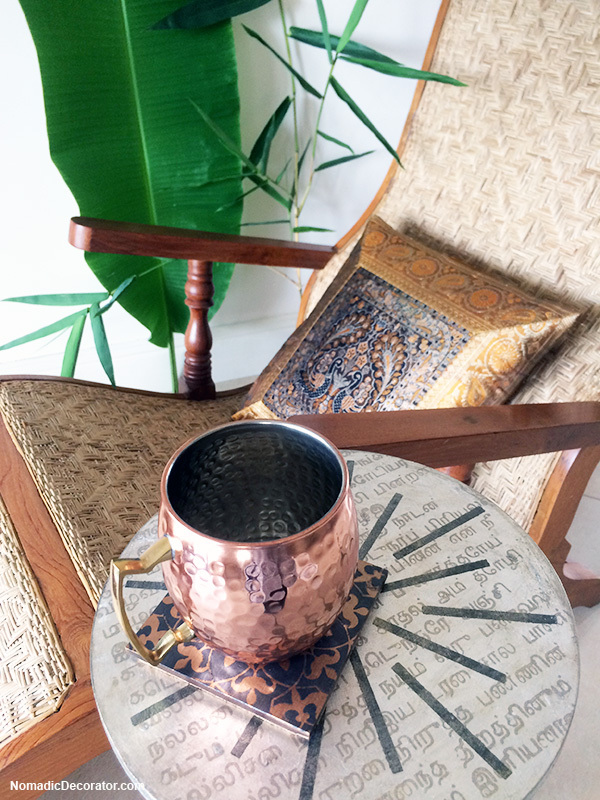 To make coasters, simply glue the 4″ x 4″ cork to wood squares. I had wood glue with me, so I used that. Then, paint base colors on the wood squares. Paint any color you want. 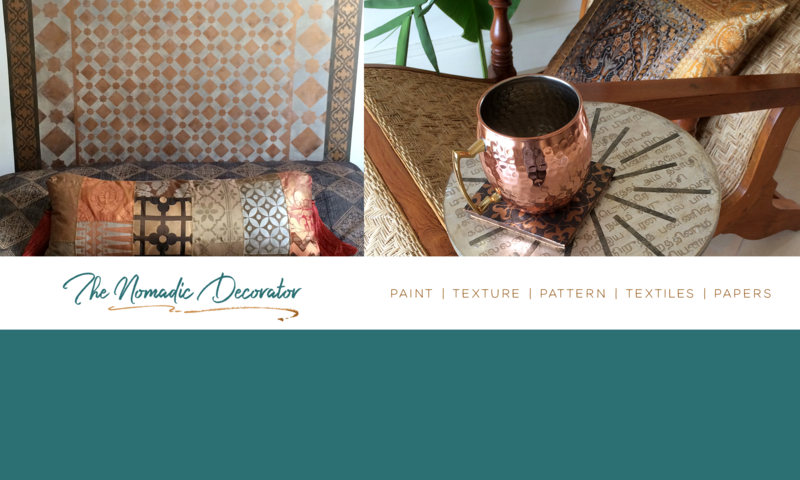 I painted a mix of metallics — silver, bronze, gold and copper — with Stencil Cremes from Royal Design Studio. Now, stencil shapes onto the wood squares. You can use stencils that fit within a 4″ x 4″ square. But you don’t have to be limited by that. 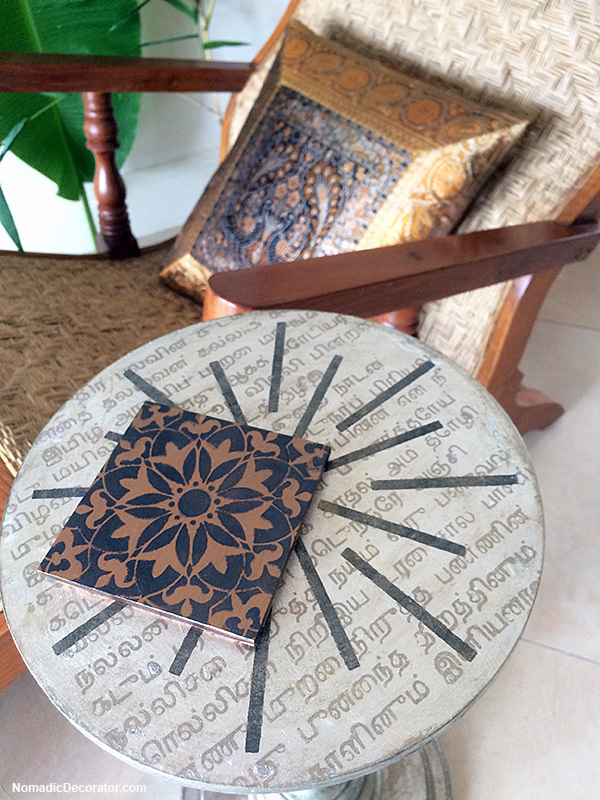 You can use any size stencil — just stencil a small part of the design on a coaster. I’m sorry I can’t provide step-by-step photos — I didn’t photograph the actual painting. I painted these really fast. My husband and I were chatting with our electrician and carpenter. 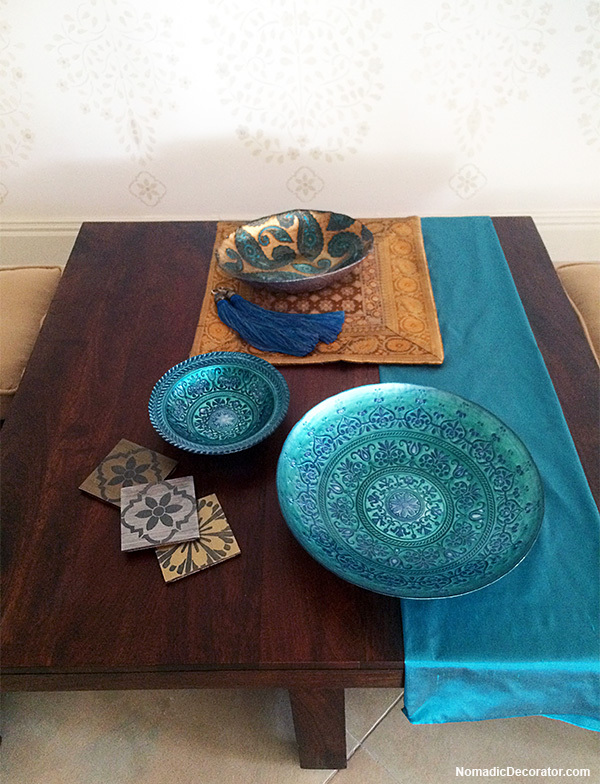 They had helped us finish projects in our India apartment — a raised wood wall sconce and a silver leaf candlestick table. 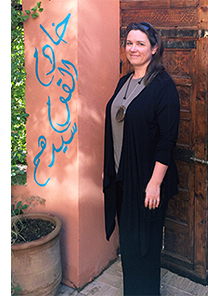 Both of those projects were painted with stencils, and they wondered how the heck I did that. They hadn’t seen things like this before. I said, it’s easy! They looked skeptical. I said, I’ll show you! So I pulled out the coasters, which I had intended to paint anyway. While we were all sitting around the dining table and chatting, I painted and stenciled the coasters to show our electrician and carpenter how to do it. They were amazed. I told them, I’d love to find a cooperative around Chennai and teach women how to stencil like this, and make products. Our electrician said he’d pay $10 for the coasters. He asked, how much did it cost to make them? I said, “uh, about $10!” We all laughed. No money to be made there! But I paid retail prices in the U.S. for materials. Our electrician said there’s free wood all over the place — he’s on job sites where lots of good wood, tiles and other materials are thrown out simply because the homeowners didn’t like them. Sometimes it’s new stuff that’s being ripped out! Nice project. Patterns on the coasters really impressed. The round table is also very beautiful, I also have a table like this in the garden and often drink tea every morning. 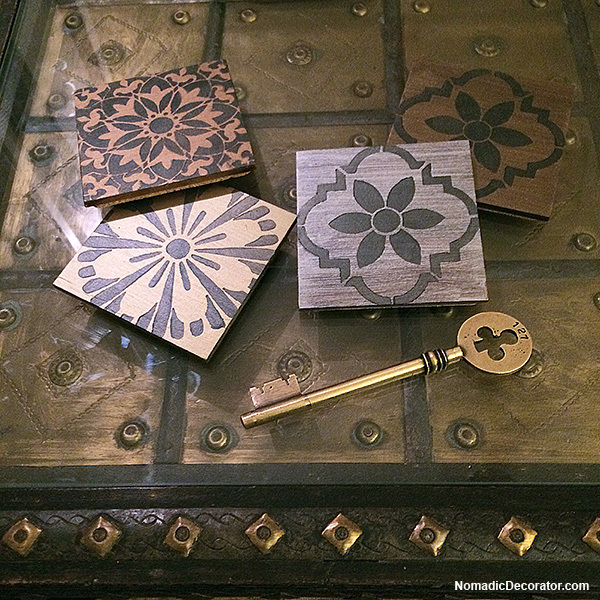 Deb, you have combined 2 of my favorite decor items–stencils & coasters. I love your design aesthetic! How you seal the coasters to prepare them for use with your cold drinks? Thank you so much, Sherry! I have so far found the Royal Design Studio Stencil Cremes, which I used here, to be so durable that I did not seal these coasters. 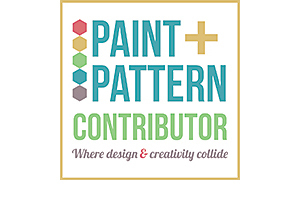 I’ve used the Stencil Creme paints on some other coasters that I’ve used for years, and have not yet had any problems with sweaty drinks affecting the paint. But also, I rarely ever have to clean the coasters. I would think wiping them with water or using soap might affect the paint if it’s on a smooth non-porous surface.